Letting apps run in the background, when you’re not using them, is convenient but comes with some drawbacks. On one hand, background apps can send notifications, check for updates, and receive information without your oversight. However, having many apps running in the background can eat up valuable resources and waste power How to Optimize Windows 10 for Battery Life How to Optimize Windows 10 for Battery Life Battery life is a pretty important factor for mobile devices. While Windows 10 does offer new features to manage power settings, the defaults are not necessarily contributing to optimal battery life. Time to change that. Read More . By default, Windows 10’s Modern apps can run in the background on your PC. Here’s how to prevent them from doing so. Select Privacy, then Background apps on the left sidebar near the bottom. You’ll see a list of installed Modern apps, including pre-installed apps. To prevent one from running in the background, toggle its slider to Off. If you want to block all apps from running in the background at once, toggle the Let apps run in the background slider. This does it all in one click. Any apps you disable here will thus only be able to work when you have them open. It’s tempting to disable them all at once 9 Windows 10 Features You Can Safely Disable 9 Windows 10 Features You Can Safely Disable Windows 10 is packed with features, but a lot of them are unnecessary. 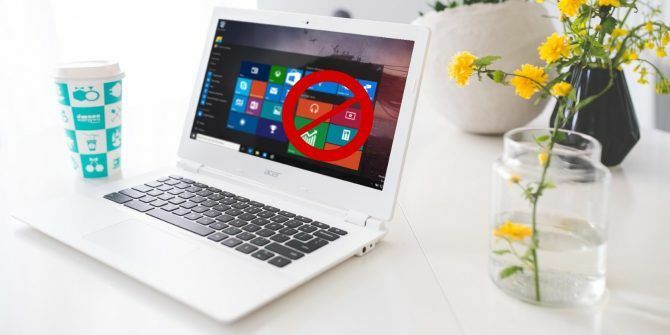 Here's how to safely prune unwanted features off your Windows 10 system for a more streamlined experience. Read More , but consider whether you use any of the apps. If you prevent Mail from running in the background, for example, it can’t notify you of new messages. And if you’re seeing high disk usage from the WSAPPX process What Is WSAPPX and Why Does It Cause High Disk and CPU Usage in Windows 10? What Is WSAPPX and Why Does It Cause High Disk and CPU Usage in Windows 10? Wondering about the WSAPPX process in Windows 10? Does it cause high disk or CPU usage? We'll show you what WSAPPX is and how to fix its resource usage. Read More , it’s probably related to apps running in the background. Disabling ones you never use can help with this issues. Unless you have a rogue app, disabling all these probably won’t make a huge performance difference unless you have a weaker PC. But it can still help a bit, especially if you have lots of Store apps installed. Do you let background apps run on your PC or have you disabled them all? Are there any Modern apps you use frequently? Tell us in the comments!